Studio 30 square meters with private bathroom and kitchenette. Studio is spacious for two and ok for family with younger children. Price is pr person. No charge for 0-5 years of age. 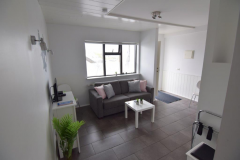 Studio Accommodation for 2-4 people. Spacious for 2-3. Bed linen and towels included. Washing machine in bathroom. Free Wifi and parking. Great location. Only 200-250 meters to several restaurants, museums and nice sports area with swimming pool with hot tubs and slides. Only 1,5 hour drive from Keflavik airport.